Hello. My name is Ashley. I have a pen/pencil addition. I know many of my fellow teachers out there also have this same sort of addiction to some degree. When I saw JetPens was offering up some samples of pens to review I just had to sign up! My pen arrived in the mail today! Yay! 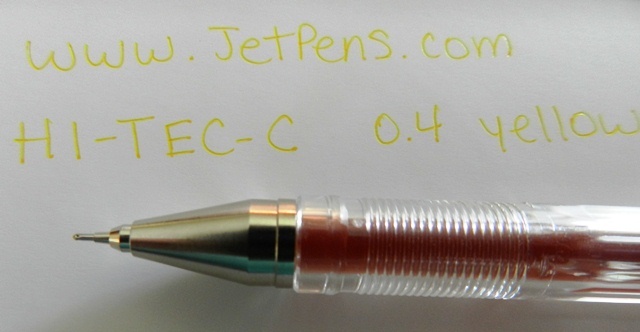 The pen I received was a Pilot Hi-Tec-C gel pen in the 0.4 mm tip size. The color was… yellow. At first I was excited. Then not so excited. Then excited again. Yellow is one of my favorite colors but… yellow is not a very practical color for a pen in my opinion. However, I was still excited about trying it out. The pen isn’t the cutest in terms of looks but looks aren’t everything, right? I really like how the lid clicked into place so it doesn’t come off when I write. I’ve used a lot of gel type pens in the past where the lids would not stay in place. Annoying. This lid stays perfectly put. I LOVE the tip! I didn’t think I would, it being so thin and all but the more I wrote with it the more I loved it! Most gel pens I have used in the past have a tendency to smear really bad. This one didn’t smear at all when writing on regular old paper but when I moved to something like a greeting card, it did smear. Obviously you would need to let it sit so it has time to dry a bit. The pen is not waterproof, so be careful not to spill anything! The yellow pen is available in a set of 10. The set will run you $32.00. Pricey if you’re not a pen addict. Maybe less pricey is you are obsessed with having the same pen in many colors. However, if you’re looking for an individual pen those are $3.30 and are available in several different colors (although I didn’t see the yellow one for sale individually). These pens are very popular in Japan right now and hard to find in U.S. stores. I love the way it writes so much I think I may just have to pick up one or two in more functional colors. These would make excellent pens to write with or doodle with. You could do some very intricate designs with such a fine point. 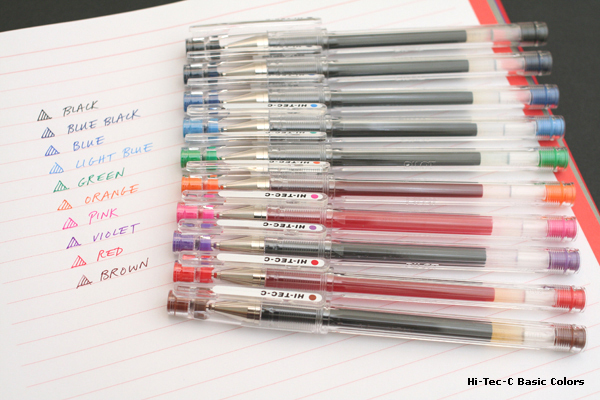 The Hi-Tec-C pens are available on jetpens.com in various colors. Visit Jet Pens by clicking on the link to the site here or to Hi-Tec-C pens specifically here. Never heard of or visited the Jet Pens site? OMG! Pens and pencils GALORE! In every color imaginable! It’s easy to lose track of time when browsing their juicy products! They specialize in Japanese writing instruments. I love fun and colorful pens!! Thanks for sharing! !